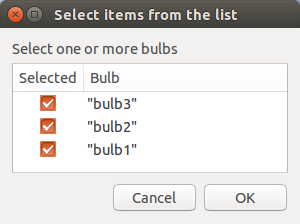 Bulb names are configurable but I'm lazy. Yes, it's just the Zenity color selection dialog. These are quick and dirty scripts using Zenity, but they work (at least under a default Ubuntu install) and make playing with the bulbs a lot easier. I haven't tested this on any other Linux distributions but as long as Zenity and netcat are available they should work. The code is up on github and can be cloned with 'git clone https://github.com/mccollam/belleds.git'. If anyone uses this or has any suggestions I'd love to hear about it!